A number one choice among cut-resistant gloves is the Portwest Level 4 Cut-Resistant Nitrile Foam Coated Gloves A645E8, which use a super strong HDPE and glass fibre liner to protect against the worst of cuts. 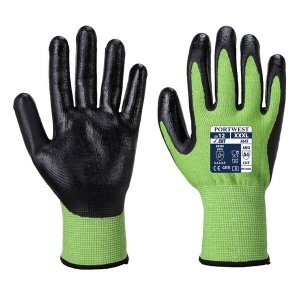 Ideal for use with food, these gloves feature a nitrile foam coat that works to enhance grip in bad conditions. 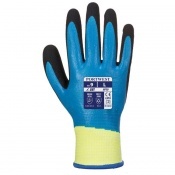 The unbeatable level 4 cut resistance of the Portwest Nitrile Foam Coated Gloves makes them ideal for use with food. 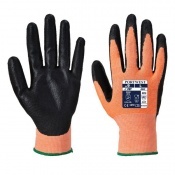 They offer a thick, 13 gauge, HDPE and glass fibre liner that protects against the worst of cuts, while their flexible nitrile coat provides enough dexterity for the user to use sharp materials such as knives quickly and safely. 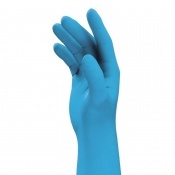 As a fishmonger my partner has found these gloves to be of excellent quality and good comfortable fit.